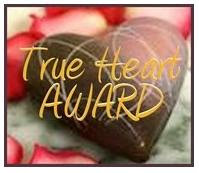 I gratefully accept this award and wish to share it with my fellow bloggers and sweet daughters. For they fit the description of a true heart, not just in blogosphere but in real life too. "Those who receive this award are of the sweetest nature. They are kind, friendly, funny, loving, eager to share their love for Jesus with others, and brave in their efforts to reflect Him to this darkened world. They are the kind of folks you're blessed to know, even if it's only in the bloggy-sphere." To read more about my budding bloggers and forever friends check out this post and you will agree that they are more than deserving. Their blogs are private but if you would like to check them out, leave me a comment saying so and I will make sure you get a link. Truth is this it is really hard to narrow it down to just a few. There are so many out there who have in one way or another blessed me in blog world. And I have met many ladies who are living as a testimony to our Lord. And that is a True Heart. You will be thankful that you took the time to check out these sometimes funny, sometimes inspiring, sometimes joyful and sometimes tearful blogs. Ooooo! I am just jumping up and down for joy for you! I love seeing you receive blog awards. Yours is simply inspiring, loving and inspirational as well. I have come to know and love you as my twin that lives in another town in another place but we are connected in so many ways. Congratulations not only for being everything that this award conveys but passing it along as well. Hey it's a chocolate award as well. That makes it twice as nice! I think its wonderful to pass it along to your daughters and back to Hope. It is an honor to receive it as well. Well deserved Kat! Giving you ((HUGS))!! from here! Thank you for the shout out and award. I definitely agree that you are most derserving of that award. You are the inspiring, funny, joyful and sometime tear jerking blogger. I will have to swing by a few of these fellow award winners and check them out. Thanks for being a loyal commenter and blog friend. Have a wonderful weekend away! Congrats Kat! You really deserve this award. Thanks for recognizing my blog and most importantly, for sticking around even though I can only update once or twice a week! Thank you for being exactly what the award Hope has given you conveys! I agree with Kat (the OTHER one.. lol)... You are such a special person, one I am grateful to know, even if it is just through our blogospheres! I love seeing that I am not alone in my walk, in my ideals, in my expressions... You are an incredible Woman of God, and I thank you for the inspiration you offer to me to be a better one! Sending you huge hugs as well! I love seeing your awards! You really deaserve them. You write straight from the heart. I've noticed you even smile while you blog. awwww...thanks for the award Mom! So sweet of you. It is great that you have met so many friends blogging. I'm glad you enjoy meeting other ladies who share the same views as you. I know you don't know many real friends who do. Congrats on your awards. You totally deserve them. YOu are such a sweet blogger. Kat, Congraulations on the award. It is a sweet one! And thanks so much for passing it along to me! You are so sweet and kind! I am happy to accept it and I will definitely pass it on to a few of my wonderful sweet friends who truly have a sweet heart too! congrats on a well deserved award! And thanks for the great list of other blogs to check out....looks like we enjoy some of the same wonderful people, and then some. Congratulations, Kat! Thank you for your inspiration and gift! Kat, thanks so much. I'm really looking forward to tomorrow. Congratulations, I have a special surprise waiting just for you. Hop on over to my blog and check it out. Congrats, you are a sweetie and you deserve it! Thank you for the sweet comments my friend! That's the amazing thing about blogging, all the cool people you meet (like you!). Your blog interview is up and running along with your ultra cool customized award I can't wait to see you post on your blog. Congratulations and can't wait to see just how God pours forth His blessings on you.